The lighting scheme for this “cool place to crash” reflects the edgy and urban tone of the Assembly brand. This cosmopolitan look is instantly apparent at the entrance where chevron-shaped lighting is positioned in repetition above the door, and then on the ceiling that leads to reception. Throughout the corridors narrow downlights keep the space moody, yet ensure the room doors are properly illuminated (so guests can see what they’re doing). 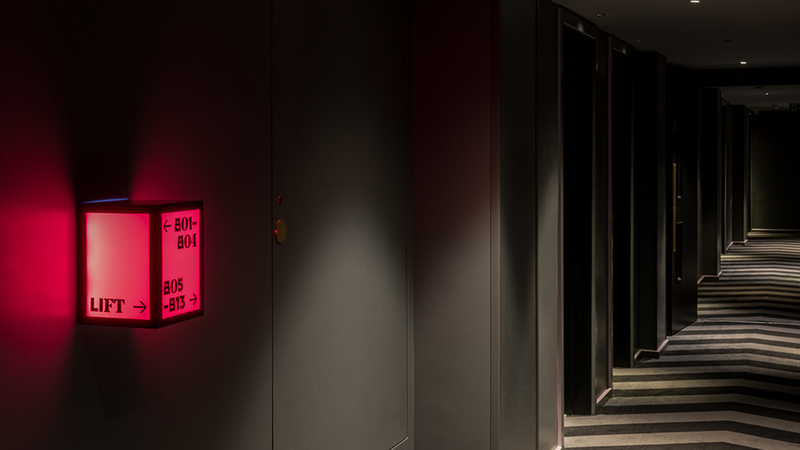 Illuminated bright pink signage boxes punctuate the walls to encourage wayfinding, while adding a pop of provocative coloured light in a relatively dark space. 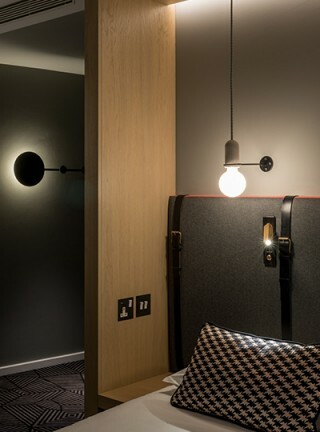 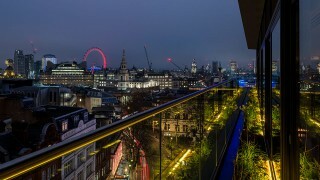 The cosy bedrooms have a tube-shaped light on the wall as you walk in, mimicking a neon baton. 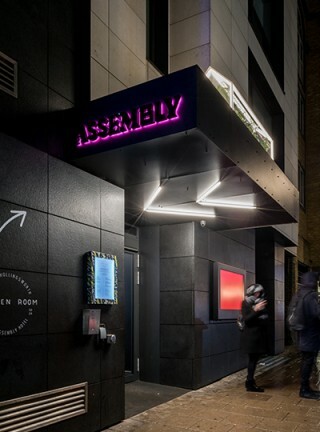 When guests enter, it gives off a deep magenta glow, turning to a more practical white light when the key card is inserted – the effect is playful and surprising, and right on brand. 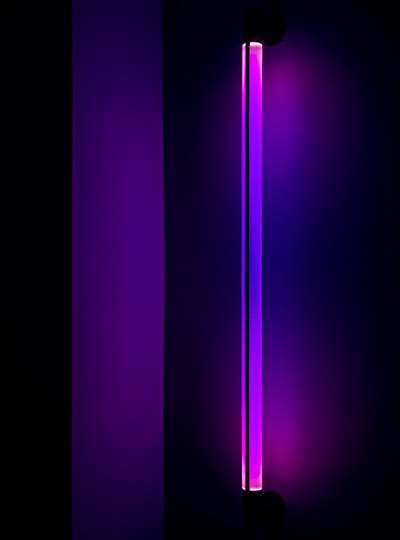 This striking magenta is carried through into the bathroom in a similar way. 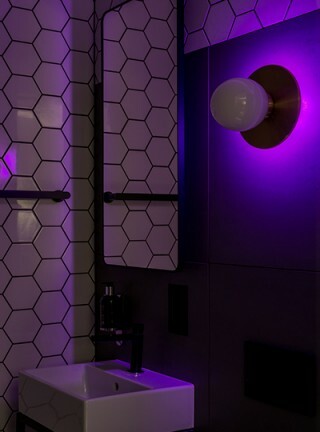 Before entering, the frosted globe wall light’s brass plate is back-lit with a magenta light reflecting off the white tiles. 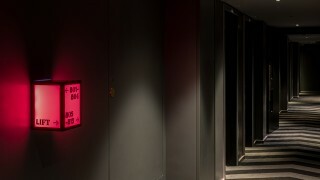 When the light is turned on the magenta back light disappears, and the white globe turns on, for a more functional purpose of ensuring non-shadow, diffuse illumination in front of the mirror. Around the bed there are various options for controlling the lighting. 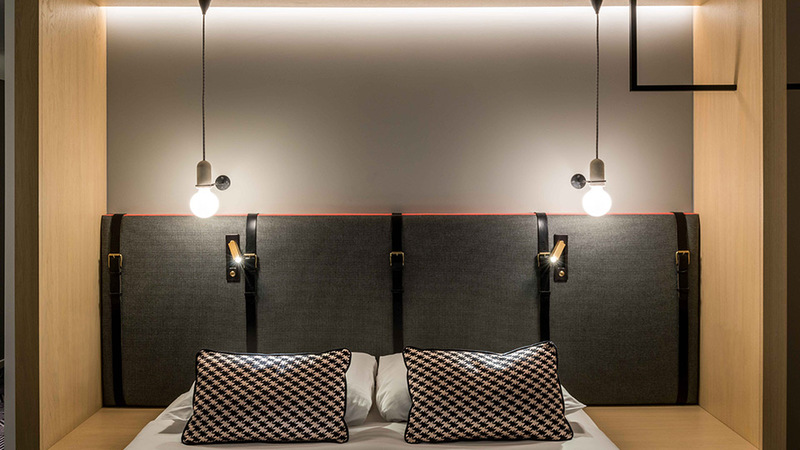 An integrated cove detail above the bed washes the back wall with an ambient light and a pair of suspended naked bulbs with a concrete-like base provides an urban, industrial feel. Reading lights are fixed on either side of the bed frame, with dimmable switches for all of these, at arm’s length. 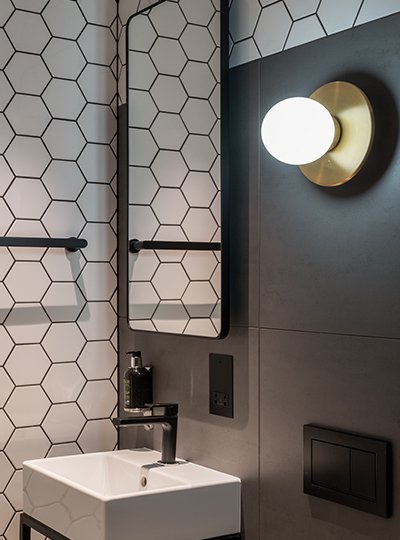 The mix of sophisticated and exuberant lighting design approaches within each space.